The Dolomites have to be one of the most beautiful mountain ranges in the world. There are countless long routes at all levels of difficulty. The rock is limestone, the quality of which can vary dramatically! Many of the climbs have short approaches, and the longer ones can often be accessed via lifts. Definitely a classic and historical climbing destination. Most of the routes are "old school", so feel out the ratings. Traditional climbs: Most of the major mountains have traditional lines up them requiring a selection of climbing gear consisting of wires, cams, and "threads" which consist of kevlar cord that can be slipped through holes or around hourglass features and tied off. A selection of quick draws supplemented with multiple long slings is also appropriate to reduce rope drag on the circuitous route lines. Finally, over time the traditional lines that get relatively few ascents have deteriorated significantly in terms of the fixed protection (old pitons). If you choose to climb a not highly traveled route, it is probably recommended that you bring a piton hammer with a selection of pins as this is the only gear that is possible for considerable distances on many lines in the Dolomites. Sport climbs: There are now also hundreds of sport climbing areas with single to several pitch routes and there are many multi-pitch sport climbs up major faces. These multipitch sport climbs tend to be significantly harder than the classic traditional lines and can feel a bit "run-out" compared to the single pitch lines close to the ground. Via Ferrata: The term Via Ferrata translates to Iron road or path of Iron in English. These are paths up sections of mountains in the Alps, and are especially popular in the Italian Dolomites. 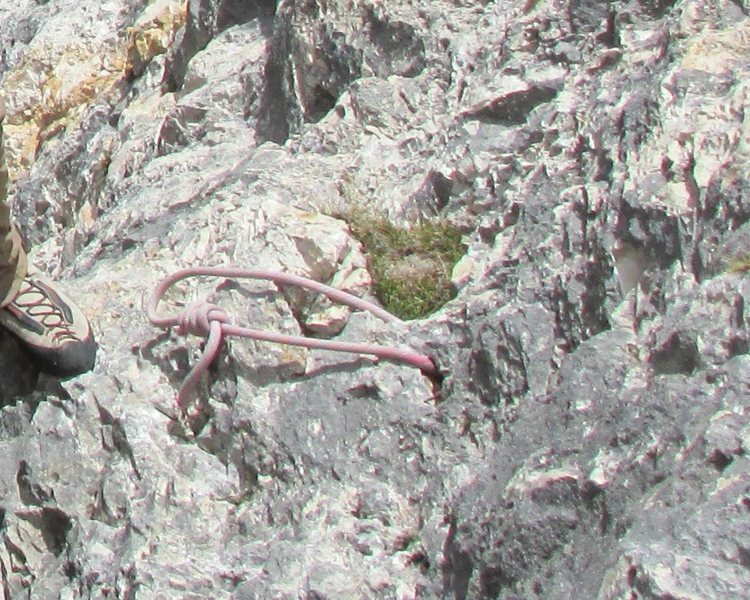 These routes tend to be well marked paths through a section of mountains and where the difficulty increases or the exposure is significant they consist of a steel cable fixed to the rock every 3-10 meters, with occasional metal rungs or even ladders and bridges to assist hikers up the mountain or ridge. Many of the early the Via Ferrata were established during the First World War to aid the movements of military personnel in their attempt to establish lines of defense in the mountains. Since then these older Ferrata have been upgraded with newer cable, post and rigging and many newer Ferrata have been created just for tourists. Climbing Ferrata is big business for the local communities in the Dolomites: On a warm sunny day in July or August there may be thousands of people on a single popular Ferrata  requiring queues up the entire mountain. Often at the summit there is a bar with food, alcohol and occasionally a Tramway back to the base  making for an enjoyable hike in the mountains and good R&R on the summit (welcome to Italy). In general these routes are much less committing than any nearby rock climbs as the routes have a fixed cable all the way through all difficulties (that you can pull of if preferred or if slippery), and they have relatively well traveled descents with no rappels. Gear requirements include a harness, a helmet (required due to the busy nature of the routes and the quality of rock in general in the mountains), some form of a rigging to clip to the cable (dual arms with two carabiners), hiking shoes and a pair of gloves to protect your hands from blistering. There are commercial riggings available for about 80 Euros and they are very nice, however a climber with a retired rope can create their own rigging for essentially nothing using gear they should already own (search the internet or check a guidebook for homemade designs). Occasionally a short section of rope is useful on the very difficult rated Ferrata to belay up any partners who are not experience climbers. Depending on the season and the route  there may be a need for crampons or ice axes on the descent (or just climb down the route you ascended). For experienced climbers these routes are very easy  even when they are graded as very difficult - unless you choose to climb them without grabbing the cable - then they can be very stout 5th class or unclimbable in places. Never the less, they make a great day out if you just want to go for a hike in the mountains but get some exposure. They are also nice for an early morning rapid ascent during questionable weather days where you might not wish to commit to a big wall (stay off of them if lightening is forecast). These are also superb ways to get your kids out into the mountains climbing at a young age  no gear, no ropes  just moving fast over stone. The classic routes in the Dolomites are graded using the UIAA system. The modern sport and mixed climbs use the French grading system. Here is a table to assist you with understanding these grades in the Yosemite system. Beware that there are a lot of "easy" grades on routes but all but the most popular of these routes often have very little opportunity for gear placements (or quality fixed gear), loose rock and little chance for escape so they make up for their grade in commitment. The Dolomites are located in Northern Italy. Fly into one of the larger cities in the area and drive to your destination. It is worth checking flight costs into the following cities all which are within a few hours drive: Munich Germany (4 hours), Innsbruck Austria (2.5 hours), Milan Italy (4 hours), Venice Italy (2 hours). You will need a car to get to the climbs so part of your trip research should include car insurance issues as many credit cards will not cover you for a car rented in Italy, but will if you rent it in Germany. Also consider luggage costs when you plan your camping or lodging. The least expensive and most climbing efficient method of staying in the Dolomites is to rent a Van with fold down seats and live in the van during your trip. You can park on the side of the road near the trail head for your next project and hike in from there. In general if you are clean and discrete you will be left alone. Camping with a tent in the woods is technically illegal - so if you choose this you need to set up late and tear down early and again pick up after yourself. At times it will make the most sense to hike into a route and stay near the base. In this setting camping can be very difficult unless there is a designated bivouac (again tents are technically illegal except as an emergency bivouac at dusk - just tear down early). More commonly one should consider staying in a Rifugio - but these cost in the 40-50 Euro range per day for lodging and food. If you wish to base camp with others or your family and leave stuff in a safe place you will need to stay in one of the many commercial campgrounds. These tend to be nice in terms of facilities (hot showers, pub, store for minor items, Gelateria, etc) and they are a great place for your kids to play with others and access the town. However, they can be a bit pricy (5-10 euro per car plus 5-11 euro per person plus 5-10 euro per tent per night). Finally if you intend to stay awhile, renting an apartment is often a similar price or less than commercial camping plus you do not need to haul all your camping gear to Italy and if you have a not uncommon bad spell of weather you will be more comfortable. ● East Face "Via Finlandia"
The Tre Cime from Forcella di Laverado. Piz Pordoi, near the Sella Pass. Cimone della Pala from San Martino di Castrozza. Langkofel Group, with Fuenffingerspitze in center. Dito di Dio (Finger of God) in Sorapiss Group. Piz Ciavazes, a popular climbing destination. Marmaolada, the Queen Peak of the Dolomites! Geisler peaks under new September snow. Sass Pordoi on the way down from Sellapass. Cinque Torri from the East. Descending from a Dolomite summit via Via Ferrata. Very picturesque church near Schlern. The Sella Towers, an iconic view of the Dolomites. This Via Ferrata had a new bridge as well. The Dolomites are a stunningly beautiful range. I'm not aware of another destination that offers so many long routes for rock climbers, without the complications of glacier travel. If you like long, free routes at grades that mortals can climb, this is the place for you. It's also worth noting that the local food is fantastic. There are two drawbacks to consider. First, the rock can be tricky to protect, especially if you're an American climber raised on clean granite or sandstone cracks. There are crack systems here, but you'll also encounter face climbing with funky pods and holes... consider bringing some old Lowe tricams (the passive kind) to place in the pockets. Locals also master the art of threading holes with slings, though my granite-trained eyes rarely spot these placements. Bottom line: Don't launch off on routes near your max until you have a feel for protecting the rock. Second, there is a bit of loose rock around. Ask locals about the rock quality on your intended routes. When it's really hot, rockfall increases significantly. Note also that the worst rock quality rating given by many Italian guidebooks is "buon", or good. The 4th Sella Tower, for example, is rated buon, but the top is total kitty litter. Wear a helmet unless you're suicidal. I'm currently sending this from Wolkenstein during a rain delay in my climbing. Mauro Bernardi had a new guidebook released in 2016; "Climbing in Val Gardena; Dolomites." Subtitled "The 70 finest multi-pitch Alpine climbing routes." Tristan - I'd just bring a bunch of long shoulder length skinny slings to girth or basket hitch so you don't have to "tie off" cord. Via Ferrata . . .